Floral sales are expected to reach $2 billion this Valentine's Day, but with some arrangements left on shelves after the holiday, Portland-based The Bloom Project expects to receive up to 6,000 donated bundles of blossoms. The nonprofit's team of 200 volunteers will repurpose these bouquets into gifts for patients of hospice and palliative care, representing one of the organization's largest donations of the year. "As you can imagine, the days following Valentine's Day are among the busiest at The Bloom Project," said The Bloom Project founder Heidi Berkman. "We're extremely grateful for the continued support of our floral partners. Flowers are known to improve emotional health, positively impact mood and make intimate connections. The entire team at The Bloom Project is honored that we can share this with the region's hospice community." Throughout the year wholesale floral companies and local grocery stores donate thousands of unsold flowers, which are processed and arranged into bouquets at The Bloom Project's workspace at Teufel Holly Farms. Partners include Sun Valley Group, Frank Adams Wholesale Florist, Mayesh Wholesale Florist, Oregon Flowers, Zupan's Markets, Trader Joe's, New Seasons Markets and Market of Choice. 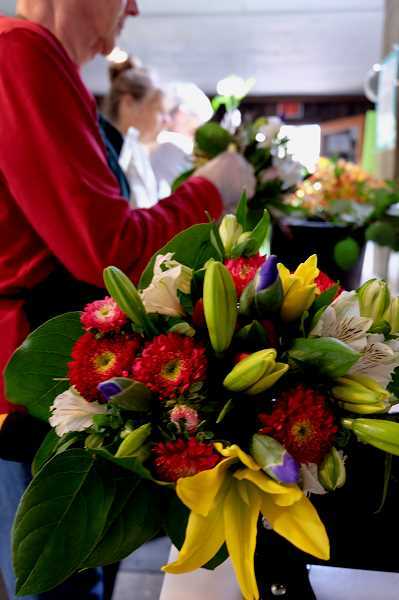 To manage the influx of flowers following Valentine's Day, The Bloom Project will host a special volunteer work session on Friday, Feb. 15 from 10 a.m. to 12:30 p.m. The Bloom Project is lcoated at 160 S.W. Miller Road, Portland OR 97225. For more information visit thebloomproject.org.